Written in the aftermath of World War I, this essay by the Pulitzer Prize–winning journalist exposes the threat to democracy posed by media bias. Nearly a century later, it remains relevant in its denunciation of wartime misinformation and propaganda and its demand for spin-free interpretations of facts and ideas. Finally I get this ebook, thanks for all these Liberty and the News I can get now! 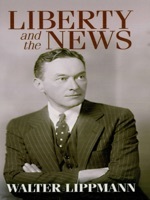 Liberty and the News was the best books I ever buy. Liberty and the News did exactly what you said it does. I will recommend you to my colleagues. Liberty and the News is the most valuable books we have EVER purchased. I'd be lost without this. I am completely blown away.